It's actually pretty astonishing that the Total War franchise hasn't tackled the bloody historical conflicts in China before. Over its 18-year history, the series has featured wars in Japan, Rome, Europe, and even the tempestuous - and fictional - setting of Warhammer. 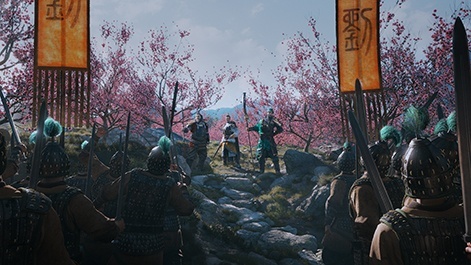 Now, Total War is finally heading to China with the latest main entry in the franchise, Three Kingdoms, set during that period of historical turmoil. "It's one of those periods that has been in our hearts for many years and our it's one of our most frequently asked for historical periods," senior gameplay designer Dominique Starr (right) explains. "Prior to the last century, this was one of the most devastating conflicts in terms of cost of human life in history. It was mad that we hadn't been there before. It was a no-brainer. Many of us were fans of the Romance and the history that spawned it, as well as the other media that came from it." 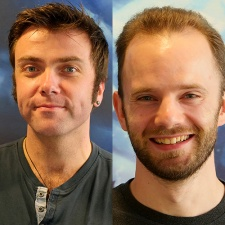 Narrative designer Pete Stewart (above far right) adds: "When we think about it, it ticks all the Total War boxes. It has amazing geography that's varied, the scope of the battle was huge - 30 or 40m people died by the end - and it also has these amazing dynamic figures and characters that we could use to drive our factions and our sandbox narrative forward and build on our other characters more to drive that." In order to capture the feel of the period - one of on-going bloodshed - Creative Assembly has added in mechanics that convey the relationships of characters who meet over and over again. "Friendships and rivalries can develop between characters based on their interactions either on the battlefield or alongside each other while campaigning," Starr says. "That will have an effect on how they perform in battle. It's not necessarily people in your own faction - it's people you are repeatedly fighting and facing off against each other, there's going to be a rivalry there. If it gets to the point that one has been defeated 20 times, that person will hate that other person for as long as time itself." In addition, Creative Assembly has tried to drive up the feeling of paranoia with a newly reworked spy system. "We're trying to play up to that whole character relationship, backstabbery, paranoia mentality," Starr explains. "In previous wars, we had agents that were deployable throughout the map and send them off on missions. Now your agents are effectively your generals - any character that is residing in our faction, recruitment or court can be predisposed to a bit of skullduggery. You might send those out to another faction and then they get recruited themselves as a spy. They can relay information to you, slowly build up a spy network and allow you to perform acts of subterfuge to disadvantage them. It's a slower burn that moving agent pieces around but the payoff is huge." Stewart adds: "You can suddenly find that your buildings are being set on fire or one of your generals has died in mysterious circumstances so you realise that someone you really trusted has been spying on you for the enemy for about 30 turns. It creates that simmering paranoia. You can make friends and rivals." 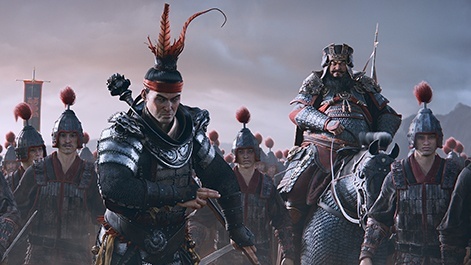 Given that the Chinese games market is becoming more and more important over time, Creative Assembly launching a project set in this part of the world - especially with publisher Sega boasting about how much money it is making from the sector - seems like it could be a cynical ploy to capitalise on this newly-emerged market. "We'd love it if China loved it because it's a game about their culture, which is really important," Stewart says. "But ultimately we made the game we felt we wanted to make. It was different, new and unique. We're treating it with the respect it deserves and we really want Chinese players to like it, but I'm not going to say it was that cynical. Even before you announce a game, you've been working on it for years. You start because you think it's going to be a good game, but it's worked out very nicely [with the Chinese audience]." Starr adds: "This is something that's been on our minds for some time. You can see that. If you go back and look at the community forums, the fans want it. There's a genuine passion for this setting. It's serendipitous in that respect." The Romance of the Three Kingdoms is a story - and period of time - that has been covered pretty extensively, with IP such as Koei Tecmo's Dynasty Warriors managing to squeeze nine games, at the time of writing, from the period. "There's a massive cast of very interesting, larger-than-life characters in the Romance especially. It spans generations," Starr explains. "There's betrayal, romance, loyalty, friendship... it's the highest of drama. There are gripping battles and adventure. "There's the massive shifts in power. It's such a turbulent time. People can thrive on that. It's how people deal with conflict, it's how they become better than themselves, better than their enemies and how they deal with adversity. Obviously, there was a massive loss of human life and it's tragic at the same time. But it's how the society prevails regardless is what people latch onto." Stewart adds: "In Chinese history, the periods before and after are still fascinating, but it's not quite as dynamic as Romance of the Three Kingdoms with all the characters that have come out of the woodwork to make their plays during that period. It's way more vibrant and dynamic than the surrounding historical context. If I may say so, it's a lot more vibrant than our history here in Europe, sometimes. "That dynamism lends itself to a variety of genres of games as well. Action games focus on characters sweeping through men over and over again. Then you have all of China to play in in a strategic sense, which is where we step in."